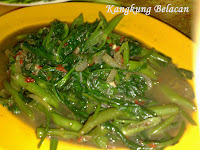 Another version of Sambal Belacan herewith, which is suitable as dipping sauce with fried brinjals and boiled spinach. 1. Prick tomato & place in a covered container & micowave High for 1 minute. Alternatively, without pricking, dip in hot water until soften. 2. Pound all the ingredients. 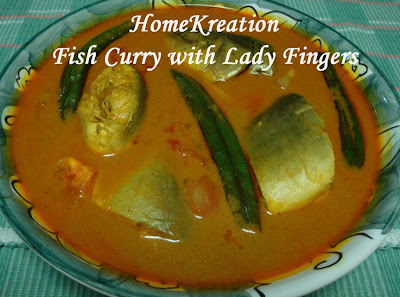 This is Sardine fish curry with lady fingers and tomatoes. 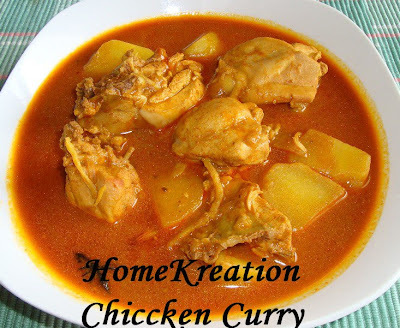 The secret of tasty fish curry is to ensure only fresh fish are used. Another recipe from the book by Zubaidah Chepa. 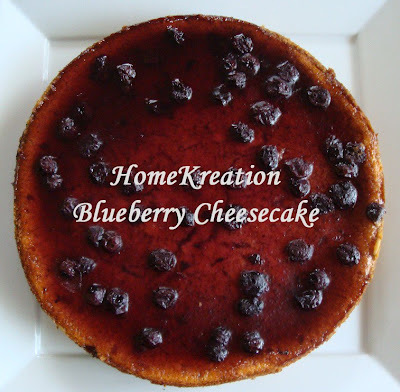 A simple plain cake which can be prepared in short time. 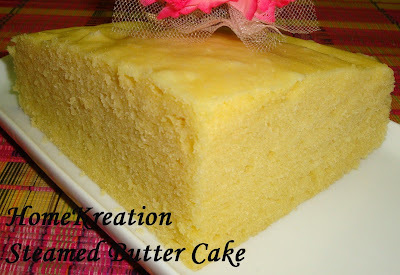 Use quality pure butter and never substitute with margarine as butter has nice aroma and produce tastier cake. 1. Beat egg, sugar & ovalet until fluffy & thick. Add in sifted flour & mix well. 3. Add in butter mixture into the egg mixture portion by portion until well mixed. 4. Grease & line cake tin 8 inch square or round. Steam on a rapid boiling water for 1 hour. 1. 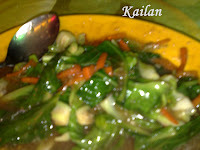 Mix all ingredients except Ulam/vegetables and stir fry without oil until fragrant. Lastly add in sliced Ulam & vegetables. Stir for a while just to blend well. I found the fresh Terubuk (Longtail Shad) in the market with egg inside. It is not easy to get the ones with egg as mostly will be monopolised by those who sell salted Terubuk Egg, a famous local product in Sarawak. 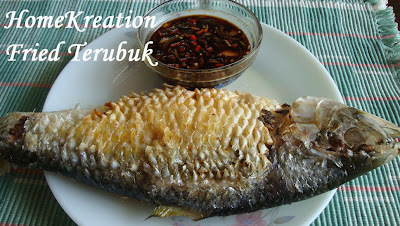 I like to shallow fry the Terubuk which is rubbed with little salt. Serve with your favourite dipping sauce like Air Assam or Sos Kicap as shown above. I cooked simple curry today which recipe does not require pounding or blending any ingredients. I purposely made it thin to reduce cholesterol from coconut milk. The children loves flooding their rice with the thin gravy as it was less spicy. 1. Heat up oil in a pot & fry sliced ingredients & those marked** until shallots are brown. Add in curry paste & stir until oil emerged (add water if it sticks to pot). Add in coconut milk and stir until boiled. Add in chicken, potato, salt & MSG. Cook until chicken and potato are tender. This lovely Carrot Cake was made by my colleague Cik Ja, which she brought to my house during Women Gathering recently. 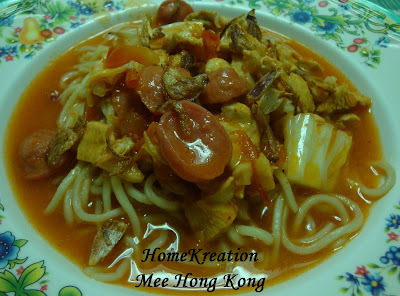 Thank-you Ja for kindly sharing the recipe which she said was given by a friend when she was in Oman but she modified it a bit. Add in oil, castor sugar, brown sugar and shredded carrots and mix well. Add in walnuts & the sifted ingredients and mix well. Fold in the egg whites into the other mixture. 3. Bake in a pre-heated oven at 175 celcius for 40 minutes. 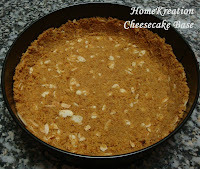 - Beat cream cheese and add in sugar & lemon to taste. 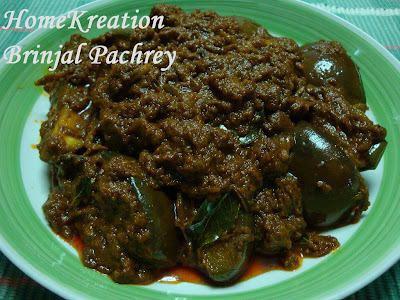 Brinjal Pachrey is a Malay dish typically served during special occassion in the old days. 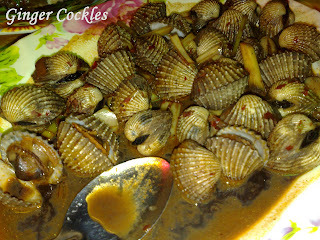 Nowadays this is sold in many restaurant as daily dish mainly in the Peninsular. 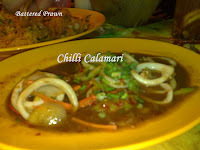 However, in Sarawak this is not popular amongst the locals as I have not found this in any restaurant here. The way it is cooked almost like cooking curry except that additional ingredient like Kerisik is a must in Pachrey recipes. 1. Heat up 5 tbsp oil & fry sliced ingredients* & those marked** until frgrant. Add in dry shrimps and fry until shallots are brown. Mix curry powder with enough water to form paste and add into the pot. Stir fry until oil emerged out of the curry paste. Add in coconut milk, Kerisik, salt & sugar; stir until boiled. Dish up when brinjal is soft. Deep fry until almost cooked. Remove oil and leave about 2-3 tbsp. Stir fry until fragrant and chicken parts are fully cooked. 2. Dish up and serve with white rice. 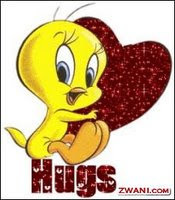 I would like to pass this Tweety Hugs to all visitors and friend who drop by at my humble blog. 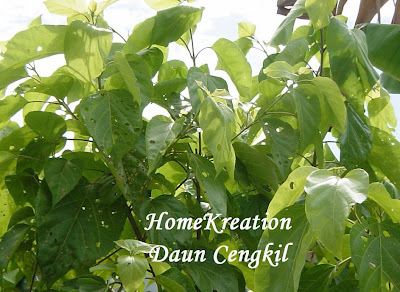 Pada semua kekawan yang singgah kat sini, jangan lupa bawa balik hadiah ni sebagai buah tangan, k.
Rules - Just answer the questions below and post in on your blogs. And of course, you have to tag at least one person, the more the merrier..
>>>> My answer is C.
>>>> So that it is neat and I can roll the bottom part as it is consumed.. Above is a top view and the bottom is sliced and turned up side down. This is very easy to make and healthy too but a bit too sweet for me which I will half the sugar next time. Anyway, my hubby likes it very much. Add in sugar a tbsp at a time while beating, until stiff peaks formed. Fold in the rest of ingredients. 2. Pour into a greased 8 inch pie tin. This is always kids' favourite. 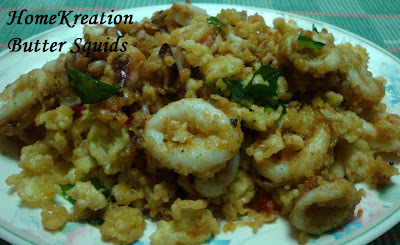 Since I am allergic to prawn, Butter Squids is a good alternative to Butter Prawns. 1. 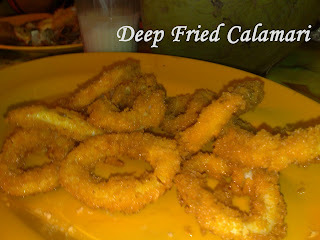 Deep fry squids and make sure not too long to prevent it becoming hard. Lift into a plate & put aside. 2. Mix all the ingredients to make crispy crumbs and enough water to make thin batter. Sprinkle into hot oil and fry until crispy. 3. Heat up butter & fry curry leaves, garlic & chilli until fragrant. 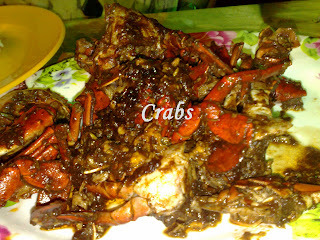 Add in oyster sauce & fry for a while. Add in fried squids and stir fry until well mixed. Add in crispy batter, stir quickly and dish up. 1. Rub chicken parts with ½ tsp turmeric powder & salt. Deep fried until cooked. Put aside. Deep fry potato wedges until cooked and put aside. 2. Heat up oil & fry pounded ingredients and green chillies until fragrant. Add in coconut milk, ½ tsp turmeric powder & boil. Add in fried chicken pieces and potato wedges. Stir and cook for a while. Got this from Amy. Thanks Amy mmmmuuuahhhhh! But I don't think my four-month-old blog is so smart or blilliant.... still crawling slowly..... thanks for the motivation anyway....! 1. Heat up few tbsp of oil & fry chopped onion and sliced chilli. Add in chilli paste and fry for a while. Add in tuna chunks, salt & pepper. Off fire & squeeze lime juice. Dish up. 2. Mix beaten egg with flour, milk, water, salt & pepper to make thin batter for dipping. 3. Flatten bread slices with a roller & cut into two parts. Fill up with tuna filling and fold. Dip into egg batter and coat with breadcrumbs. Deep fry in a flat frying pan until golden on both sides. 4. You can also roll mini sausages and sliced cheese. 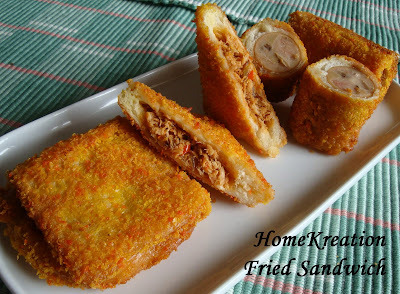 Dip into egg batter and coat with breadcrumbs & fry. 5. 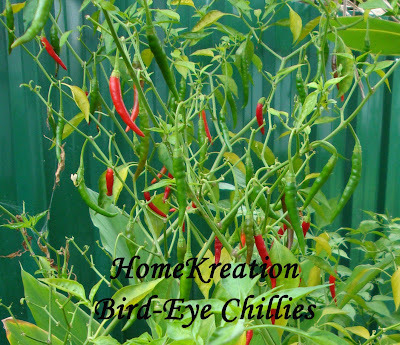 Serve with chilli sauce and mayonaise. Recently I bought a recipe book by Zubaidah Chepa and today I tried her recipe above. 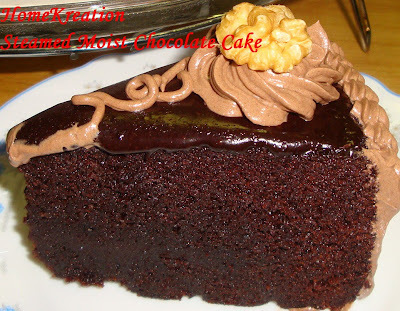 I must say that this is the best Moist Chocolate Cake that I have made so far and I give her 5 star rating for the recipe. 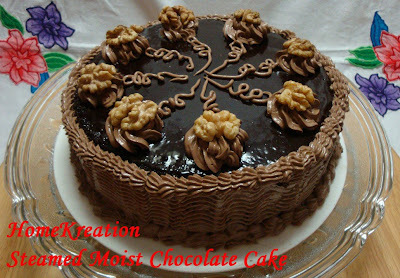 Not only it is moist but also rich and tasty with right balance of sweet, chocolatie and not oily at all. 1. Combine ingredients marked * & stir over heat for a while until smooth (no need to boil). 2. Beat eggs in another bowl until frothy & mix into chocolate mixture. Add in sifted flour mixture and mix with beater at low speed until well mixed. 3. Pour into lined & greased tin. Steam with medium fire for 1 hour or until cooked. (Make sure water has been rapidly boiled before steaming the cake). 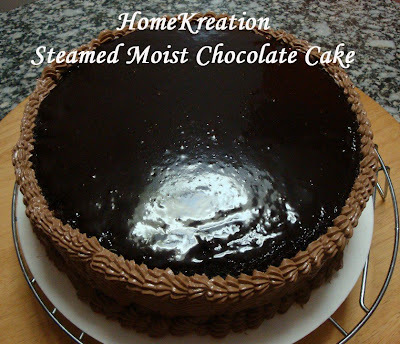 - Double boil all ingredients and pour right away onto cake. 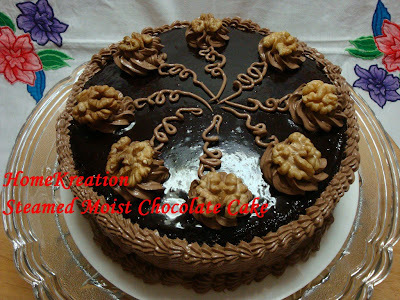 - Beat all ingredients except chocolate. Mix in melted chocolate & ready to use. 1. Mix all ingredients & marinate chicken for at least an hour. 2. Heat up a bowl of cooking oil (enough to deepfry the chicken but not too much). Fry the whole chicken pieces together with its marinated ingredients under slow fire. Add in sliced big onions half way of cooking to ensure it get golden eventually. 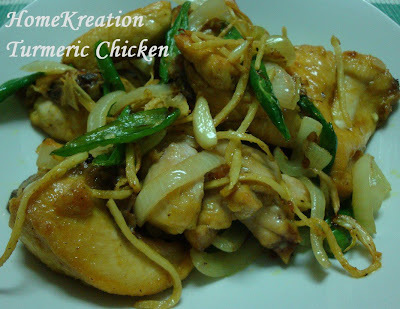 Stir occassionally until chicken parts are cooked and marinated ingredients + sliced big onions are crispy. Dish up the chicken & the crispy ingredients and toss the excess oil. Tips: Use non-stick wok to avoid ingredients sticking to the bottom of the wok before chicken parts are cooked. 3. Chicken Masala is suitable to serve with plain rice, Nasi Minyak, Nasi Briyani or Nasi Lemak. 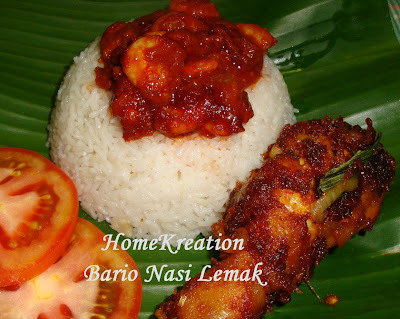 The photo above is Nasi Lemak using Bario Rice and served with Chicken Masala. 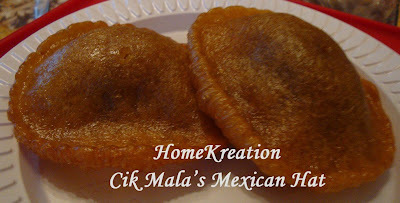 HomeKreation Nasi Lemak recipe was posted earlier on here. 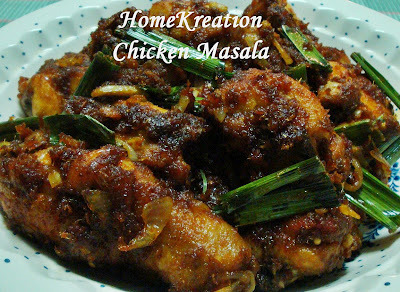 Masala Chicken recipe is in the next posting. Bario Rice is special rice planted only in Bario valley, which is located in the centre of the Kelabit Highlands of central Borneo. 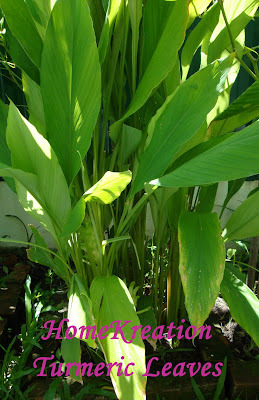 It is regarded as the finest and best rice grains from highlands of Sarawak. It is famous for its soft texture, fine and elongated grains with mild aromas and splendid taste. 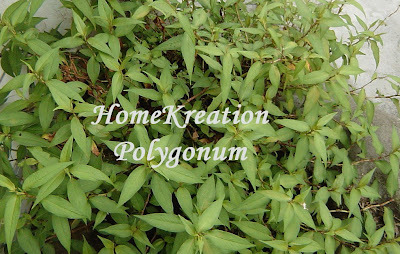 It is organically grown without any usage of of pesticides and chemical fertilizers. 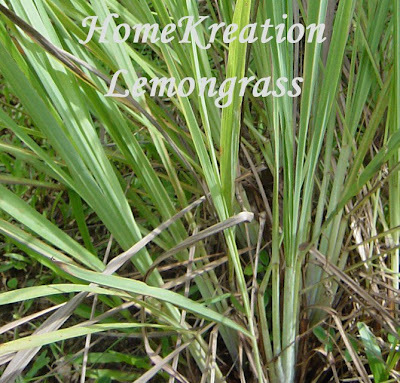 It has all the attributes of organic rice with an added flavour and unique taste as a result of the cool, pristine and unpolluted environments where it is grown. It is perfect for health conscious consumers. Ones must buy this when visiting Miri (I am not sure whether you can get from other towns in Sarawak other than Miri and of course Bario valley itself). My colleague, Pat came from Bario and she gave me a big bag of Bario rice above as gift. It is freshly harvested and more specially because it is purely unmixed with any other kind of rice. 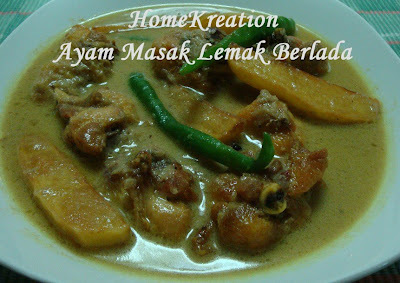 Cooking it plain is good enough but I also love to make Nasi Lemak with it as it gives real special taste. 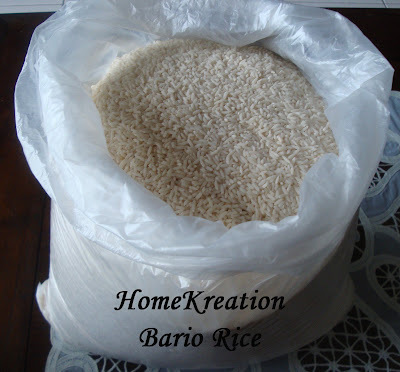 To cook Bario rice use equal ratio of water and rice. So next time you come to Sarawak, look out for Bario Rice! Mexican Hat, or called locally in Sarawak as Kuih Penyaram, was demonstrated by Cik Mala at my house during Women Gathering last Friday. 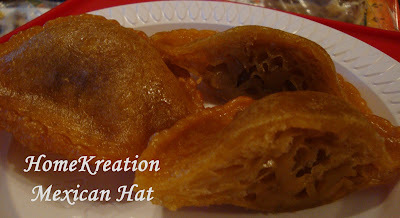 It has dome shape in the middle with spongy texture and crispy curls around it which describes how it gets the name. 1. Pour hot syrup into flour mixture and mix well until smooth. Cover and stand for at least 2 hours. For a more spongy result, keep overnight in a fridge. 2. Heat up about 1-2 cups of oil in a smal 8 inch diameter wok which has a deep dome shape in the middle. This will shape the kuih accordingly. Pour 1 scoop of batter in the middle at one spot. The kuih will spread by itself & float. Let the edge expand fully before flipping. Flip and prick the centre of the kuih to release some air & prevent it from exploding. This week is a school holiday and my three boys have been staying home by themselves. My husband just came back from outstation and our work schedule this week will not allow us to take leave to spend time with them. Apart from my youngest boy, the other two are not complaining because they are busy studying preparing for their PMR & SPM. We promised to drop them in the city in the afternoon to watch movie but unfortunately it was heavily rained with thunder, so we did not manage to be home in time during lunch break. We then decided to go out for dinner with my sister-in-law and her children. We ordered almost everything in the menu : calamari, crab, fish, chicken wings, prawn, satay (didn't turn up), cockles and two vegetables. My hubby is working outstation today, I just had badminton game and kids cried for something different than the usual rice and dishes type of dinner. When asked to vote for noodles, all the three kids gave hands up. As usual, I just cooked what I felt like cooking and why not try something different tonite. Not disappointing, all enjoyed them very much. 1. Heat up 2 tbsp oil & fry chopped garlic, sliced ginger until fragrant. Add in chilli paste & continue frying for few minutes. Add in chopped chicken meat, shrimps and sliced sausages. Stir few minutes. Add in chopped Tomato, sauces and water sufficiently and it should be thick. Add in cornflour paste & season. Add in vegetables and dish up. 2. Blanched yellow noodles (mee) and pour gravy onto it and served right away. My mum makes her Sambal Belacan without Ikan Bilis but the one with Ikan Bilis is a famous version in Sarawak that I adopted from my in laws. 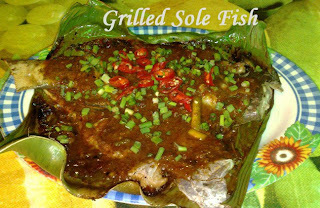 Serve this with your favourite Ulam but in the above picture I had it with young mango and boiled Jering. Emmmmmh.... real good appetiser. 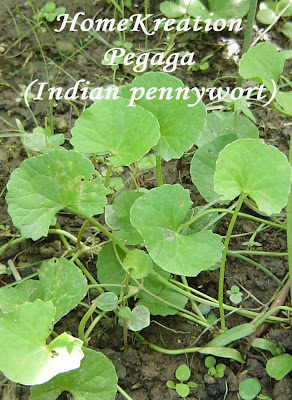 Do you know that Jering (Jiringa in English) can prevent diabetes and also good for heart. However, it is advisable to consume in moderate amount due to unpleasant smell and excessive consumption may cause formation of crystal in urination system due to indigestion. 1. Pound all ingredients to mix. 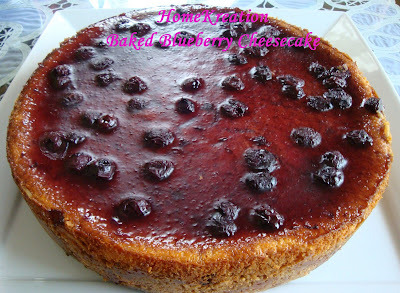 Another recipe that was served in the recent Women Gathering at my house, specially for Aline who made the request. 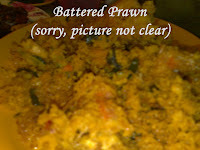 This recipe is worth keeping which I modified & developed many years ago, and eversince been sharing with many friends. The Apple Pie was a hit everytime when I served at office or home party. 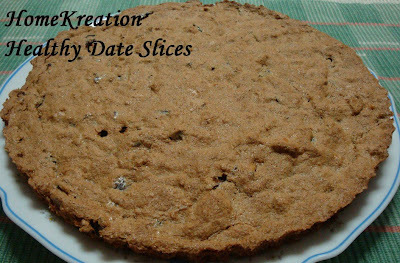 Hope others will find this recipe worth trying. 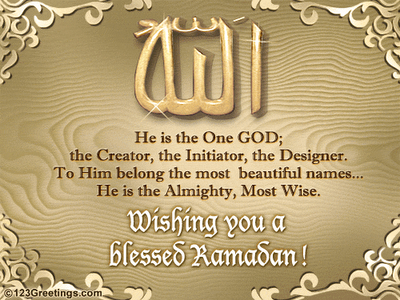 Don't forget to leave your comment here if you happen to try it. 1. Mix the first three ingredients using cut & mix method to produce breadcrumbs like. You can use food processor or do it manually using blunt dinner knife to do so. Make sure you do this quickly before butter is melt to ensure crispy pastry. Don't worry if there are butter bits, you must not knead before adding egg & water. 2. Add in egg yolk & mix with finger and if a dough is not formed, add water a tbsp at a time until a ball of dough is formed. 3. Chill it for 20 minutes and then line the pie tin. 1. Peel, halved, cored and sliced apples 3/4 through - see the picture above. 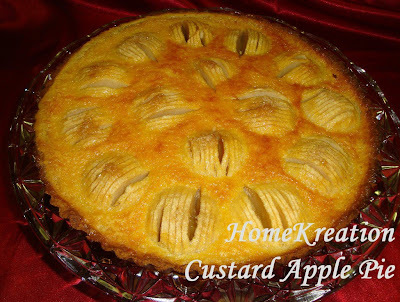 Arrange apples onto the prepared pastry base. Sprinkle sugar & bake 200C for 20 minutes. 2. Beat eggs and sugar until well mixed. Add in cream and beat to just mix. Bake at 180C for 20 minutes or until custard is set. 3. Produce one 10-11 inch diameter pie. This was also served in the Women Gathering yesterday. 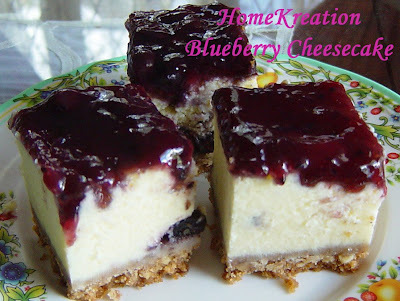 Blueberry Cheesecake is Rusydi's favourite, my second son. He has tried making this himself and was successful. The following photo is the one made by him early this year, which I have shared in MR before this. 1. Mix all the base ingredients and press into a springform tin. Chill. Add sugar, lemon zest & juice & cornflour. 3. Pour half of mixture into the prepared base. Spread blueberry pie filling and then pour the remaining mixture. 4. Bake in water bath at 150C for 1 hour (I am too lazy to use water bath and it is ok). Let cake cool in the oven & chill overnight or at least 6 hours. 5. 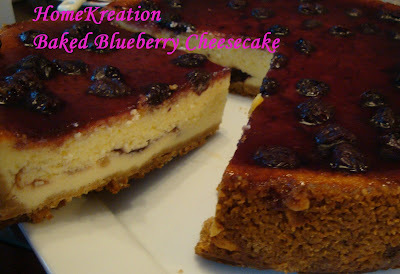 Mix all the topping ingredients and spread onto cheesecake. Chill until it is set.